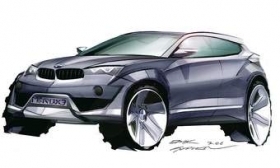 The new BMW X3, shown here in a recent sketch, is expected to help BMW raise U.S. sales by 10 percent next year, BMW executives say. SPARTANBURG, S.C. -- BMW CEO Norbert Reithofer says there is significant room for growth in the U.S. luxury segment but the premium market won't return to the 2 million-unit level until 2013 or 2014. BMW executives, here to preview the redesigned X3 crossover, said the luxury market today is tracking at about 1.5 million vehicles. The company counts Mercedes-Benz, Audi, Jaguar, Lexus, Volvo and Saab among premium brands. Reithofer said his outlook is based on other countries, such as Germany, where the premium segment is 30 percent of the total market. “That means fierce competition between Mercedes-Benz, Audi and BMW,” he said at a meeting with journalists here, where BMW also is touting its latest plant expansion. Persistent high unemployment, a housing slump and changing spending habits have put a damper on U.S. new-vehicle demand. In the past, U.S. consumers often refinanced home loans to draw cash for major purchases that often included a new car. U.S. light-vehicle sales rose 10 percent for the first nine months of this year, but many automakers were hoping for a more robust recovery at this point in the cycle. "The global economic slump has changed the way consumers view and purchase all premium products from luxury watches to expensive homes,” said Jim O'Donnell, president of BMW of North America LLC. “It has had a profound effect on the auto industry as well." Reithofer said becoming the No. 1 luxury brand in the United States is not a goal. “It is not our first priority to overtake Lexus in America. It is to be a very good premium brand in the United States,” he said. Residual values, incentive spending and volume “all have to be in balance,” he added. While the Chinese market is growing rapidly, the premium segment in China is likely to account for 7 percent of the total market in 2010 and is still developing, Reithofer said. BMW is building a second factory in China, but rather than make a large sedan, it will produce the compact X1 crossover that goes on sale in the United States next year. O'Donnell said that BMW sales in the United States are likely to increase 10 percent this year and that the brand will outpace the premium market next year because of the new 5 series. Next year BMW will benefit from the redesigned X3 crossover, redesigned 6-series coupe and convertible, a freshened 1-series coupe and convertible and the launch of the all-new X1 crossover. O'Donnell predicted that the U.S. premium market will rise 10 percent in each of the next two years. O'Donnell forecast that BMW brand sales in the United States will reach 212,000 to 215,000 cars this year, up from 196,502 in 2009. BMW Group's sales, including Mini and Rolls Royce, are expected to rise to 260,000 vehicles this year, up from 242,087 in 2009. BMW Group's sales reached 336,000 vehicles in 2007. Meanwhile, BMW's product chief said today the automaker will boost capacity 50 percent at its factory here to 240,000 vehicles annually by next year, but the expansion won't be enough to warrant an engine factory in the United States. Frank-Peter Arndt, BMW's board member for production, said U.S. output would have to reach between 500,000 and 700,000 annually to justify an engine plant. “This is a volume we do not require here in the United States,” he said. BMW has spent $750 million to expand the plant by 1.2 million square feet and add the redesigned X3 crossover. BMW produces about 160,000 vehicles a year at the factory. Spartanburg opened in 1994 and currently assembles the X5, X6 and X3 -- all crossovers. The X3 was previously built by supplier Magna Steyr in Austria. Production was shifted to the U.S. plant to further reduce BMW's exposure to currency fluctuations. By building it in the United States, BMW has been able to lower the base price of the X3 28i by $2,100 compared with the current model, to $37,625. The crossover goes on sale in Europe in November. U.S. sales are being delayed until early next year because BMW wants to introduce two variants at the same time. The X3 35i with its larger engine will have a base price of $41,925, including shipping. O'Donnell said Mercedes-Benz's aggressive pricing with the GLK SUV has forced BMW to take similar action with the X3. “There is pressure on us to keep prices more or less stable,” he said. Through September, U.S. sales of the GLK totaled 21,944, while X3 sales have totaled 6,067. O'Donnell said BMW wants to regain leadership in the segment. The only BMW crossover not produced in the United States is the X1, and BMW won't shift its production from Leipzig, Germany, Arndt said. He said that although it's too early to say what additional vehicles could be made in Spartanburg, he could not rule out making passenger cars in the future. The South Carolina plant also has built the 3-series sedan and Z3 and Z4 roadsters. About 70 percent of the factory's production is exported, making BMW the largest automotive exporter from the United States to non-NAFTA markets, Arndt said.